Was this offer real? 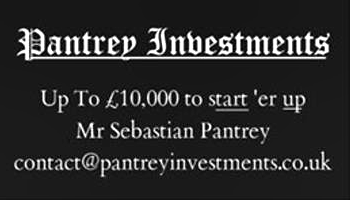 The domain pantreyinvestments.co.uk is registered in the name of VistaPrint Technologies Ltd.; a company with a Bermuda address, acting merely as a domain reseller. There's no content on the website, other than a placeholder image advertising the host. Why is this such a question mark? Similarly-registered domains have been involved in rental scams, and there is a long list of adverse domain name ownership decisions for VistaPrint Technologies. Bogus job offers are a common fraud, often involving significant sums of money. In some cases, funds to start up a business or purchase employment training materials may be fronted, on the condition that purchases are made from an "authorized provider" run by the fraudster. Checks provided to pay for the purchases bounce, or are found to be fraudulent, and the mark is left to pay. Sometimes people to which the payments are made from or to are caught up in the scams. International payment providers such as Western Union and MoneyGram are often involved, and provide lists of schemes involving their services. I assure you and everyone involved that this is all a big misunderstanding. I am just looking to invest in a business with my own money as venture capital. My understanding of this subculture and how it has grown has lead me to believe that maybe there is untapped potential. I admit my wording could have been a lot better but I was not offering employment to anyone, merely freelancing, if I have interpreted that right. I don’t have a website because without anything to post other than my business cards and poster designs it seemed like a waste of time. I guess that putting .co.uk on my business email address gave off the wrong impression concerning official documentation. In my defence, business and legal advisers I have talked to have assured me one didn’t need to set up a firm to be an investor and that the business card design had no misinformation. I asked for the help of “Exodus Arias” and “Noha Kitsune” so I could have something for a website or at least the social media pages to show that I am severe in helping people get noticed in a tasteful manner for future prospects and endorsements. “Noha Kitsune” suggested I send an email to Londonfurs directly with my idea but I wasn’t sure if it had gone through. It is indeed my fault on that end for not trying again. I didn’t give “Noha Kitsune” any notice prior to me attending the Boat Party because he had gone silent on our Twitter conversation for nearly a month and I assumed that he wanted nothing more to do with this little project. The least I could do was shake his hand in person and thank him for his time. I didn’t know if he was going to be there but decided this would be a good chance to witness this community with my own eyes for research purposes and hoped that I could at least see if other attendees would be hopeful entrepreneurs themselves looking for venture capital. I didn’t converse as much as I would have liked while there, maybe it was nervousness or maybe because I didn’t belong. I wasn’t planning to attend The Meetup at Tank and Paddle the next day, “Noha” did point out on Twitter that he was usually busy at these gatherings but I concluded after the Boat Party that this might be my only chance to bury the hatchet. I went there and needless to say missed my chance. Then the very next day “Noha Kitsune” sent his belated reply on Twitter as if nothing happened. Given the timing I’m rather surprised this didn’t boil over sooner. I can also assure you, I was unaware of the fine print concerning the usage of photography at conventions prior to all my enquiries. I don’t blame anyone for thinking that I was being ambiguous for the sake of deceit. This has been all my doing, clearly the “less is more” approach was the wrong choice. All I can do is humbly plead miscommunication, my innocence and beg for forgiveness from all involved. 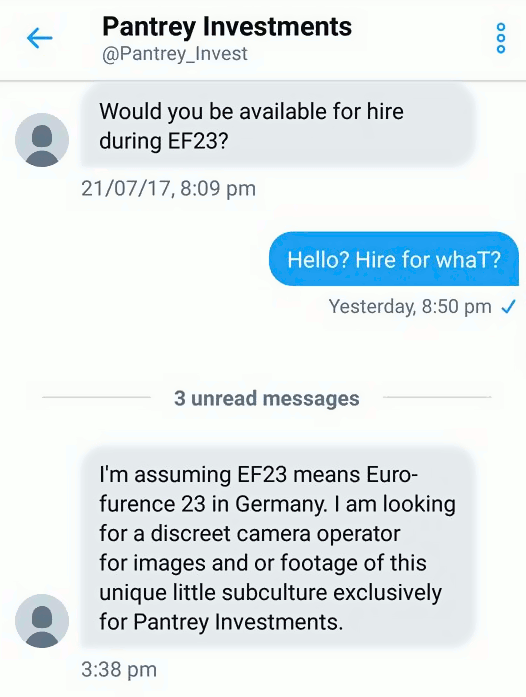 Even if legitimate, Eurofurence – a con previously targeted as an example of Western decadence by a subsidiary of Russia Today – does require board permission for commercial use of convention photography, as noted by Exodus. Violations of such provisions have led to bans at other events. In any case, it's wise to do a little checking up on the background of potential work offers, especially if what they're offering seems to be good to be true, requires you to trust someone you don't know, or involves you taking advantage of the trust of others. They might be taking advantage of you, too. And if you're the one making the offers… try not to be too mysterious about them! Have you received dubious offers of furry-related employment, linked to hints of advance payment? Has anyone solicited you to sell photos or videos to the media? Let us know in the comments! I got the occasional probe when I was actively posting con photos a decade ago. It's hard to tell whether there's more demand as events have multiplied and grown, or less because there's sixteen cons with over a thousand people and we're not news. We received a response today, which I have published above. Perhaps it will provide some clarity! His response doesn't seem to clear up much to me. What exactly is it he was wanting the photos for? His website, yes, but...why? Did I just miss something? Well, there are a few more business cards here, if that helps. It seems socks are optional, as long as your feet don't stink. Personally I get by mostly on text - but then I'm not offering to invest in people's passion projects, just run my own. Why does the underlining on his business card seem to emphasise "tart up"? Pay close attention to the word "discreet" in the attached chat, and think "bow chicka bow wow"